Mayor Rahm Emanuel on Tuesday unveiled his proposed 2016 budget to the City Council. Included is a $543 million property tax increase that would be phased in over four years to fund Chicago’s police and fire pensions. Beginning this year, property taxes would increase by $318 million, then by $109 million next year, $53 million in 2017 and $63 million in 2018. “One thing we know for sure: we cannot cut our way out of this crisis," Emanuel said in his budget address. "To fund our pension obligations through cuts, we would need to cut 2,500 police officers – 20 percent – from our ranks. We would need to close 48 fire stations – that represents half of our fire stations – and lay off 2,000 firefighters, about 40 percent of the force." Cuts to other services such as garbage collection and recycling, rodent abatement and graffiti removal would be needed as well, according to the mayor. “In short, if we were to fund our pensions with cuts alone, our city services would become unreliable. Our city would become unlivable. And that would be totally unacceptable. That is why this budget contains a city property tax increase phased in over the next four years. Every dollar of that increase is specifically committed to keeping our promise to Chicago’s police and firefighters,” he added. Homeowners whose properties are valued at $250,000 or less would be spared from the property tax increase. Emanuel’s proposed budget also calls for levying a special property tax for school modernization for Chicago Public Schools. Other fees include a $9.50 monthly garbage pickup fee for households, new ride-share and taxi fees, and a tax on e-cigarettes. Collectively these fees, along with a building permit reform and restructuring fee, will generate $125.3 million. Aside from fees and taxes, Emanuel’s budget outlined $170 million in savings and reforms. 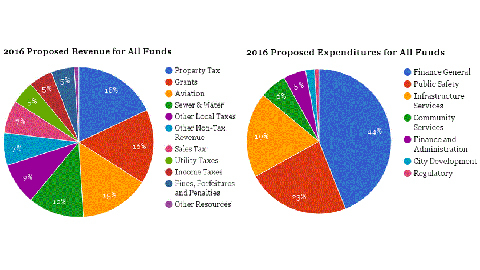 Proposed revenue for the 2016 budget for all local funds will total $7.84 billion ($3.63 billion of which makes up the city’s corporate fund). When factoring in anticipated grant funding, the city’s proposed budget rises to $9.32 billion. See the chart below for a breakdown of proposed revenue. The corporate fund is the city’s general operating fund, which supports basic city operations and services like public safety, public health and waste collection. See the chart below for a breakdown of the projected $3.63 billion in revenue. Expenditures for all local funds will total $7.84 billion: When grant funds are included expenditures will account for $9.32 billion. Proposed expenditures for the city’s corporate fund account for $3.63 billion. See how those expenditures breakdown in the chart below. The city maintains separate funds to account for its contributions to its pension funds. Under the proposed budget, a total of $978.3 million will be contributed to the city’s four pension funds. Of that contribution, $786 million will come from property tax revenue and $192.3 million from other sources, including $74.8 million from the city’s enterprise and special revenue funds.